This English jazz and contemporary classical pianist composes and teaches quietly in the west country and raises his profile rarely. Yet Alfred Brendel has called him  an interesting and highly gifted maverick musician  and Law has deserved much wider public appreciation for years. Law has been touring with a new ensemble, Cornucopia - a mix of a jazz quartet featuring Andy Sheppard on saxophones, and a group of contemporary classical players from the London Sinfonietta under the violinist Rita Manning. At the Purcell Room, Law devoted the first half to a thickly wrought single composition, Out Of The Darkness, and the second to a variety of shorter, jazzier pieces that often packed an unexpectedly funky punch. Whether he had his tongue in his cheek in naming the second section Light Music (the BBC's former put-down for anything that wasn't classical) is hard to tell - but in announcing that the second half wouldn't have  the same unremittingly lugubrious intensity  it's likely. 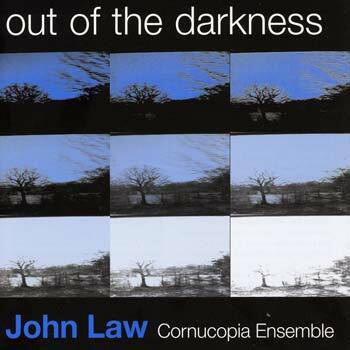 But Out Of The Darkness was an ambitious piece combining rich and slowly transforming (sometimes rather Mike Gibbs-like) harmonic movements, sudden clustered ensemble sprints and systems-music overlays of phrasing deploying, brass and strings lines against the jazz instruments. Fiendish drum parts never phased Paul Clarvis, and bursts of hurtling swing travelled on Chris Laurence's bass lines, with Sheppard's flexible sax figures skidding over the top. Law's piano improvisations were often astonishing in their boldness and technical ambition, the more so for being jazz-rooted without mimicking the usual Jarrett, Tyner or Hancock licks. Law could perhaps have edited his second half a little, but he could find his winding, contrapuntal funky licks in The Loop being hoovered up by samplists, and a wispy Sheppard blues was delicious. A rich and completely distinctive contemporay music programme. Recorded at the CBSO Hall in Birmingham, 17 October 2004, this album features pianist/composer John Law with the Cornucopia Ensemble (an octet: two violins, viola, cello, trumpet, oboe, trombone and bassoon), Andy Sheppard on tenor and soprano, bassist Chris Laurence and percussionist Paul Clarvis. The first section is devoted to an eponymous suite, which begins, appropriately enough, as a murky ensemble swirl that gradually coalesces into form and regular movement, Sheppard alternately roaring (tenor) and piping/wafting (soprano) over a supremely sensitive jazz rhythm section and the multi-textured contributions of the Ensemble. As saxophonist Jon Lloyd points out in his excellent liner-notes, Law 'is comfortable with the full weight of classical history and [...] at similar ease with the rhythms and harmonies from world musics, the shifting styles of jazz and earlier, pre-classical religious music', and all these sources are beautifully balanced, both in the 46-minute, seven-part piece that forms the bulk of the album, and in the three shorter compositions that succeed it: 'Talitha Cumi' (a delicate, lilting melody featuring Sheppard's soprano juxtaposing sweetly agile time-playing with a circular-breathing free passage), the mesmerisingly attractive 'Nocturne' (written for the 1914 silent film South), and the jaunty closer 'The Loop', dedicated  to French reeds player François Courneloup. Achieving a natural-sounding synthesis rather than an awkward 'bolted-on' effect with the forces at his disposal must have presented a considerable challenge, but John Law has succeeded triumphantly, and the album provides an object lesson in the deployment of elements too often considered incompatible. Recommended! Featuring Mr. Law's fabulous quartet with John on piano and compositions, Andy Sheppard on tenor and soprano saxes, Chris Laurence on double bass and Paul Clarvis on drums plus the Cornucopia Ensemble which includes a string quartet plus trumpet, trombone, oboe and bassoon. 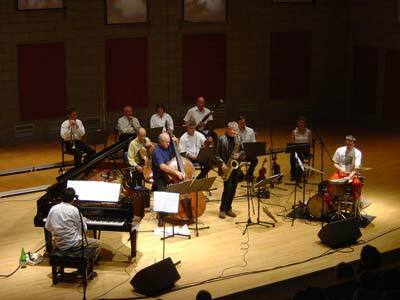 This gem was recorded live at the CBSO Hall in Birmingham, UK in October of 2004. John Law remains one of the under-recognized giants of British modern jazz/new music piano, as all of his dozen solos, duos, trios and quartet discs (FMR, Hat & Slam) can attest to. This is his first disc for a larger ensemble, his regular quartet plus an octet and it is a marvelous effort.